We are pleased to announce the sellout of all 671 original homesites at Martis Camp. In the summer of 2006, Martis Camp opened for sales with 671 homesites to be offered. This month, Martis Camp’s last original homesite sold, a remarkable feat achieved in just over 10 years. This demand is testimony to the appeal of the community and properties as well as each of our owners commitment to the Martis Camp lifestyle. With each sale, the uniqueness of the community that Barron’s praised as “The best place to own a second home in Tahoe” was further cemented. We thank each owner for their role in helping fulfill this dream known as Martis Camp. Over the same period of time another market emerged at Martis Camp, resale homes and homesites. Martis Camp Realty will maintain an exclusive focus on this robust resale market which set records in 2016 with 49 resale homes and 33 resale homesites sold for over $255 million in volume. This year seems to be following that same trend with 10 homes and 8 homesites either contracted or sold in the first 3 months, representing more than $50 million in sales. All that in the face of a winter of epic proportions. With spring and summer approaching, we believe the real estate market at Martis Camp is poised for tremendous activity and we remain as focused today as we were ten years ago in helping buyers start their legacies at Martis Camp. Please call 1(800) 721-9005 or email. 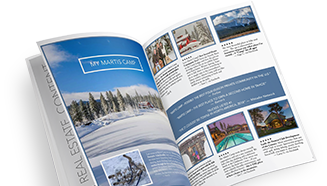 Martis Camp Realty is the leader in real estate sales at Martis Camp. The Team has generated more than 900 property transactions representing over $1.5 billion in volume. Those numbers have come about not only by listening closely and working diligently, but also by having the kind of on-site tenure each agent possesses, a collective “edge of experience” that buyers and sellers of luxury homes continue to rely on.